I made the one piece out of a ribbed knit cotton with flecks of glitter hoping it would sparkle in the sunshine. The blue top is made from a performance ribbed synthetic fabric that I sewed strand of raw cotton rope through. Kylie and I grew up together in beautiful Laguna Beach, California. We have known each other since we were about 11 years old. Although we did not go to school together, we spent many hours carpooling to youth group every Sunday night. It was truly an honor to be a part of her and Zack's special day where they celebrated their love for each other with the people who love them most. I made Kylie's cathedral veil to compliment her sleek Audrey inspired dress. With about 5 yards of fabric, I trimmed the veil with white satin bias trim and sewed it into a comb with a layer of extra drape. I think she looks like a dream. I worked with photographer and film maker, Taso Papadakis to create the costume for this project. The star of this film is Sofie, playing the role of Persephone. The key words for this outfit were, thoughtful, strong, and warrior. This film was shot in Joshua Tree and I really wanted the garment to support the environment. The materials used are deconstructed cotton rope. I draped and knotted the piece on a dress form all by hand. I wanted the costume to be soft and structured. The costume is made from 100% cotton ropes that I sourced locally in LA. I unraveled each roped to create the soft strands you see photographed. I wove the strands in an asymmetrical pattern in order to create a more organic look. Auricula Judae was my senior collection at Savannah College of Art and Design. The assignment for the senior collection is to create a six look collection starting from months of research to creating samples and muslins to making the final looks. All in all, it is about a 12 month process, with plenty of sleepless nights and emotional breakdowns. My collection went through several stages during the research process. I started with the art work of Eva Hesse. It was organic, original, earthly and warm. Then I saw some art work at a gallery in Laguna Beach by the wonderful Jenny Simon and her work was earthly, organic and colorful. The last stage of my research came from a hiking trip I took with my cousins at my Grandma's house in Ohio. The forest was deep and wooded, covered with trees and thickets. We covered our faces with clay and collected flowers, leaves and mushrooms to take home with us. When we got back we started looking up the names for our collected items and this weird little mushroom caught my interest. 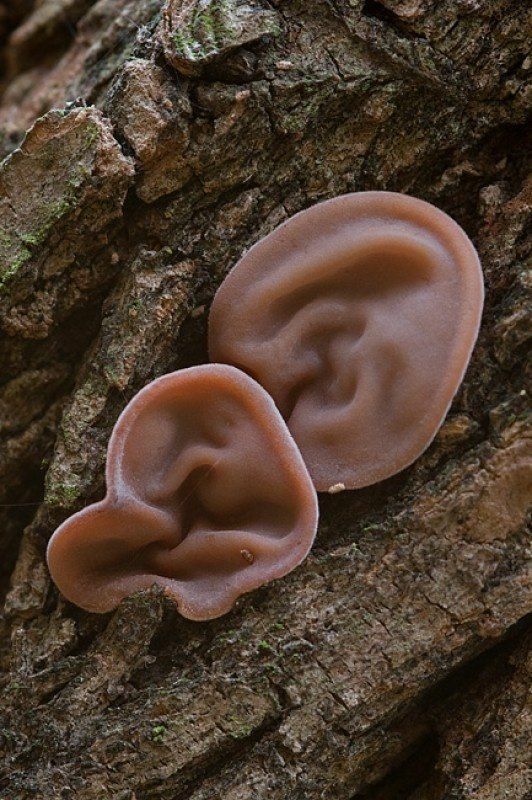 It looked like a tiny little ear and sure enough it was called Judas's Ear - it's scientific name is Auricula Judae. This became the name and final part of my collection inspiration. At that point my concept felt right. My girl is from a different time. She is a woman and the clothes she wears reflect her feminine energy and shapely curves. The textiles are representative of femininity in a non-traditional way. The textiles are all natural: wool, organic cotton, suede, and linen. They are tactile and have movement. The textiles formed with different fabrications of pleating, dying, and printing, are soft which is a beautiful part of femininity. However, the silhouettes are a harsh, steadfast and tough. She is mostly covered and in some cases has several shells, showing she is protective and guarded. The skirts and dresses are long and she loves wearing pants. I picture her trekking through the wilderness, whatever her wilderness may be. The prints were all designed by me from photos of that hike at my Grandma's house. The jumpsuit and two dresses were all hand dip dyed by me. Lastly, the knit top was machine knitted by me as well. I had the amazing opportunity to work with photographer Taso Papadakis. I made the costumes for a few of his shoots. The first one is with actress Lilimar Hernandez. The key words for this design were, whimsy, imagination, and movement. I wanted something that was fun, whimsical and elegant with a pop of color. When my best friend Katie got engaged, she gave me the honor of creating her topper- the blouse worn over the dress - veil, slip and garter. All pieces were created long distance from LA to Baltimore. We spent many months skypeing and mailing packages of samples, mock ups, and designs. It was not until the day of the wedding that I finished sewing the final beads to the veil. The topper is made with a silk gauze chiffon. I used french seams to finish the interior and attached a ribbon tie using a silk georgette. The beads are a combination of freshwater pearls, crystal, and glass. Each bead was carefully hand sewn. The veil is a blush tulle with freshwater pearls. I used scraps of the brides mother's veil to add the "something borrowed" and attached leaf like pieces to the pearls. The slip was also made with a silk georgette. The garter was made using elastic, mesh and more pieces of her mother's veil. The garter is also adorned with freshwater pearls. These are just a small sampling of some of the CADs I did for OUT Inc. for their Spring Summer 2015 line. All were done with Adobe Illustrator and Photoshop. I worked closely with the head designer and creative director of fabrics, textures and silhouette. Out Inc. is a small luxury athletic wear brand based in Newport Beach, California. This brand is for the corporate woman on the go. She runs her own business and needs to look professional, feel comfortable and exude glamour. I designed and created the bridesmaids dresses for my best friend Megan's wedding. I started out with mock ups and held a fitting for each of the girls long distance. I sourced my own fabric from downtown LA. I proceeded with cutting and sewing the final dresses. Each dress was custom made for each woman depending on taste and body type. The fabric I ended up choosing was an embroidered lace which allowed me to utilize my couture sewing skills, as most of the work required delicate hand sewing. I wanted the bridesmaid dresses to compliment the wedding dress, yet not steel the show. I had the pleasure of collaborating with Dancer and Choreographer Samantha Mohr. We worked together in developing the concept and working with the space Home LA offered through the Women's Center for Creative Work. I created the costume, which is made of organza, leather and rope. homeLA is a performance project dedicated to bringing dance process to residential space. homeLA provides a platform to independent dance, body-based, sound, and intermedia artists at various stages of their careers to develop new works and one-of-a-kind performances in response to the architecture and ethos of Los Angeles homes.